ImagInk glass technology offers a complete solution for high-precision, durable and vibrant direct to glass printing. We work closely with architects, artists and designers to deliver a wide range of decorative and practical solutions. ImagInk is our large format glass printing process, capable of reproducing full colour photography, vector graphics and textures directly onto glass with pinpoint accuracy. Containing sub-micron glass particles and inorganic pigments, the ceramic inks are lead and cadmium free, with superior light fastness and extreme weather performance. The printing process involves direct application of the ink to the glass surface in full or single colour designs. Once printed, the glass is toughened in our furnace. During this process the ceramic ink is permanently fused to the glass making it completely scratch resistant. 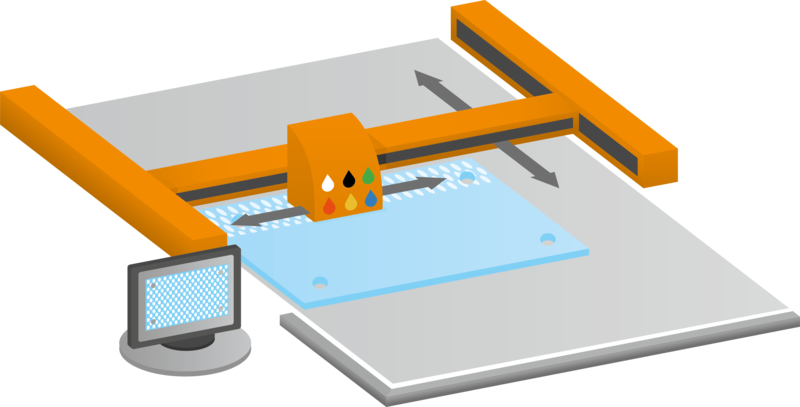 Printing directly on to the glass is both time and cost efficient, opening up creative options for artists and designers. The ImagInk printed surface can be installed facing in or out. Facing out lowers the reflectivity of the glass. The glass can also be laminated, painted, double glazed or combined with DigiGlass printing and Vanceva coloured interlayers. Performance data for individual designs is available to assist designers in the development of facades, turning a purely aesthetic element in to an integral performance component. With the ability for designs to be scaled for small scale speciality projects or large scale multi-pane developments, the scratch and fade resistant properties of the ceramic inks are perfect for external applications such as public art installations, building facades and signage applications. It can even be printed to the surface of hard-coat performance glass. All ImagInk glass is supported by our 25 year warranty against fading and discolouration from UV damage. It is important to note the ImagInk ceramic colour gamut does not offer magenta or cyan. This means very bright pinks, purples and blues will be subject to colour shifts when printed. For more information on colour accuracy and how CMYK or RGB images will translate to printed glass, please feel free to contact us and ask to speak with a design consultant. Digital files can be accepted in PSD, TIFF, JPEG for photographic images and AI, EPS or PDF for vector graphics.